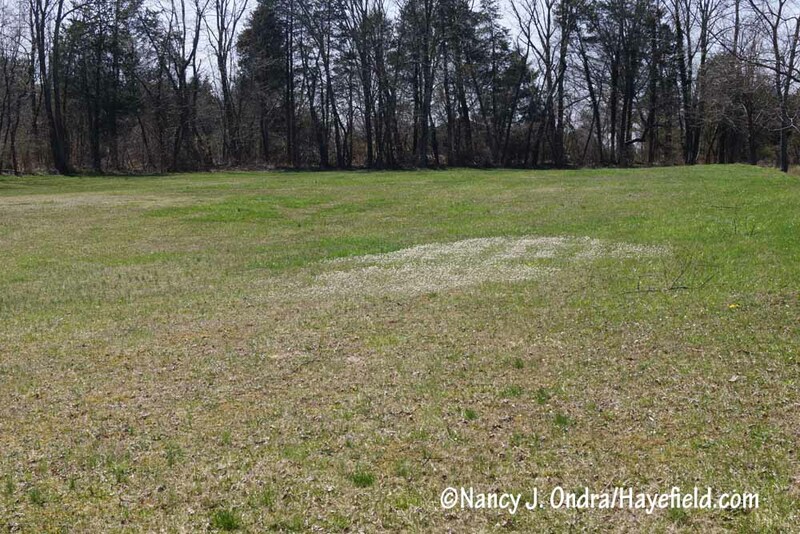 As I’ve mentioned a few (dozen) times before, Hayefield isn’t really a spring garden, so pulling together a Bloom Day post at this time of year isn’t quite as easy as at other times. I did manage to find some blooms, though, and I have some other topics to cover as well, so perhaps you will find something of interest today. 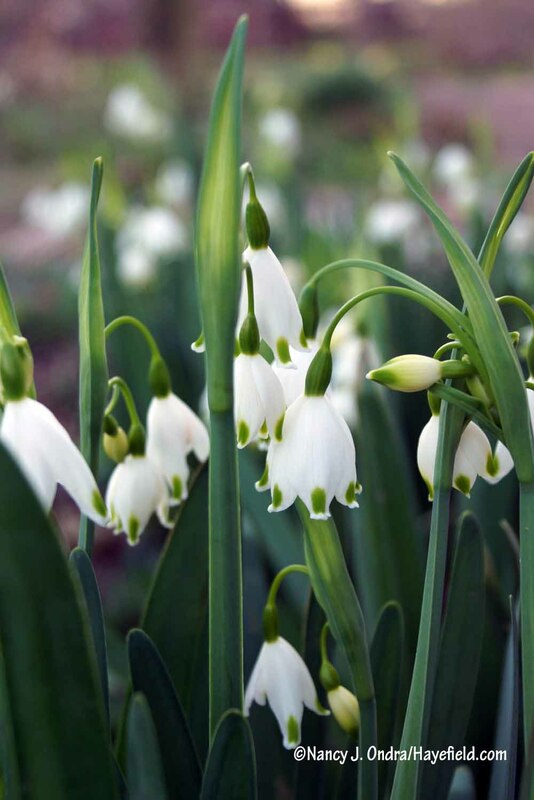 Starting with the garden…spring is a glorious time for bulbs. They all have their charms, but if I had to choose a favorite, it would be ‘Tête-à-Tête’ daffodil. 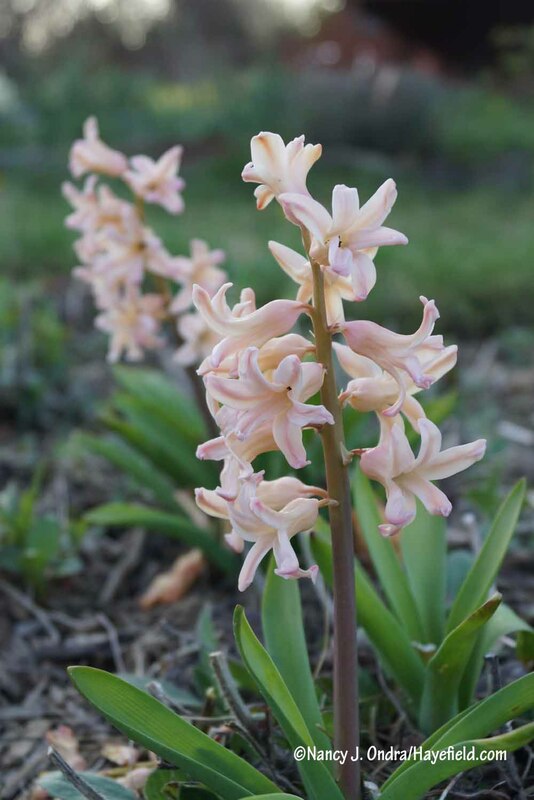 Its short, sturdy stems keep the flowers upright even in wet and windy weather, and it multiplies freely without needing frequent dividing. ‘February Gold’ is a close second. In the “I don’t remember planting this” category is this daffodil in the courtyard. I’m sure I’d have noticed the interesting coloring on this one before. I wish I knew which one it is. 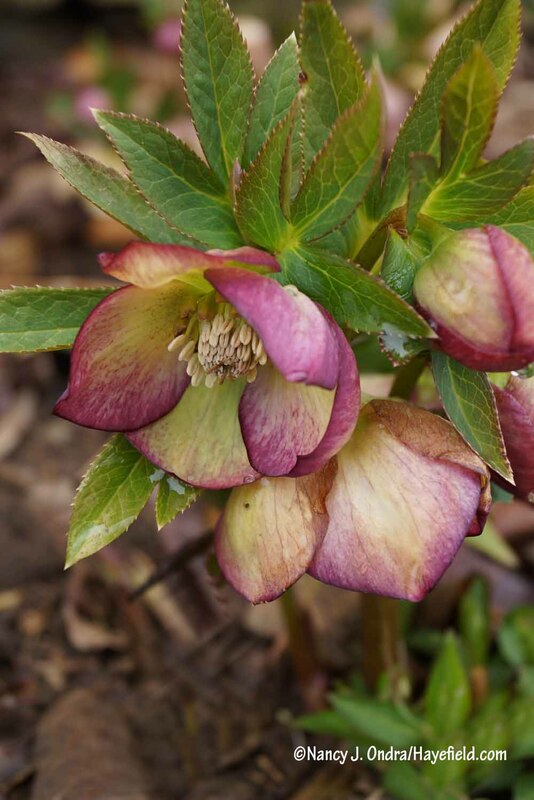 The 8-inch layer of sleet we had last month was very hard on the early-rising hellebores. Those that were already in bloom at the time were bent over or completely flattened and pretty much a loss for the year. 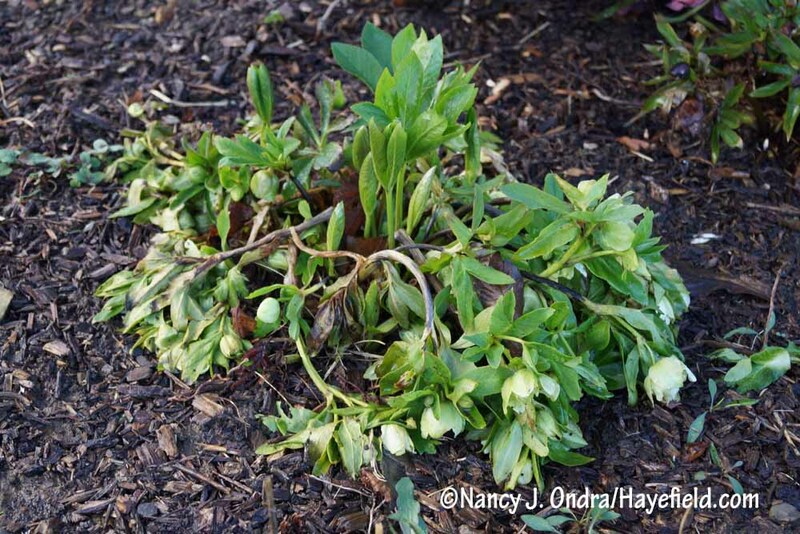 Aw, poor hellebore. Sometimes, being an early riser is not an advantage. Fortunately, most of the plants managed to get through that without damage and are now in full glory. Here are a few unnamed hybrids. The next two count as cheating, because they are temporary combinations I made when I was unloading some new acquisitions from a recent plant-shopping trip. I think I will end up using them in the same way in the ground, though. A couple other foliage favorites are looking quite nice now too. 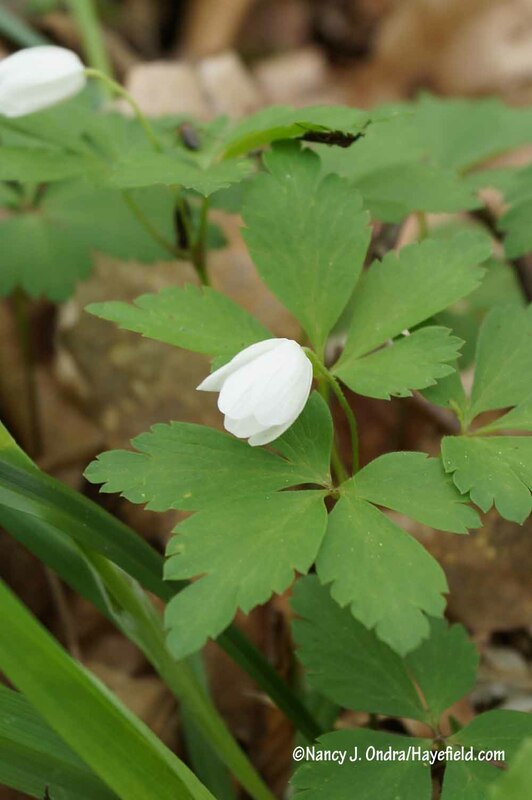 Mid-April is also a wonderful time of year for a walk in the woods. 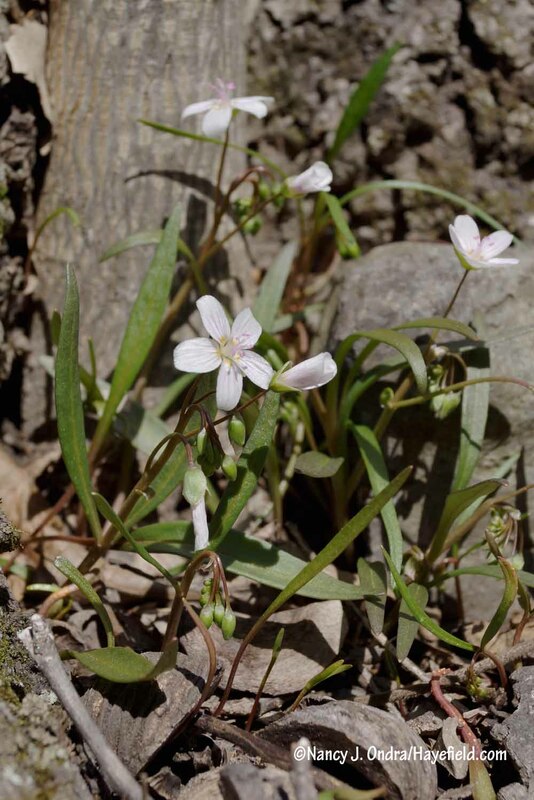 Spring beauty (Claytonia virginica) is abundant around here, often forming large patches in grassy areas. 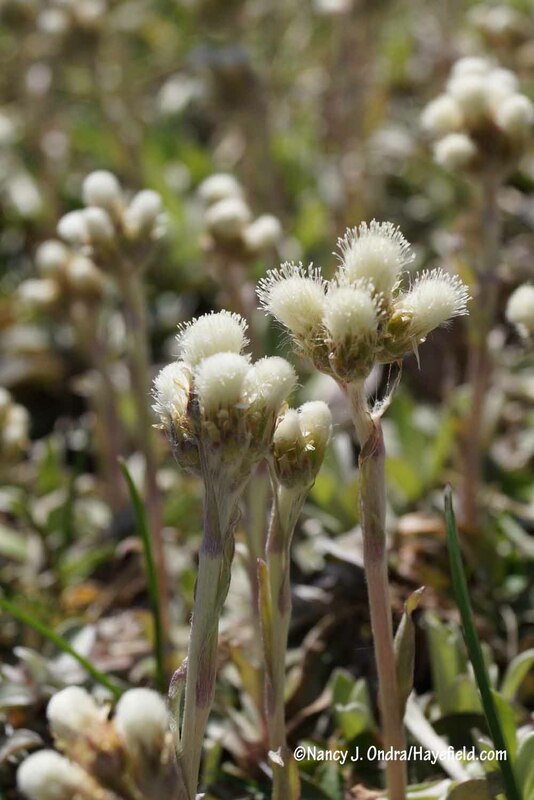 Another wildflower that tends to grow in sizeable colonies is pussytoes (Antennaria neglecta). 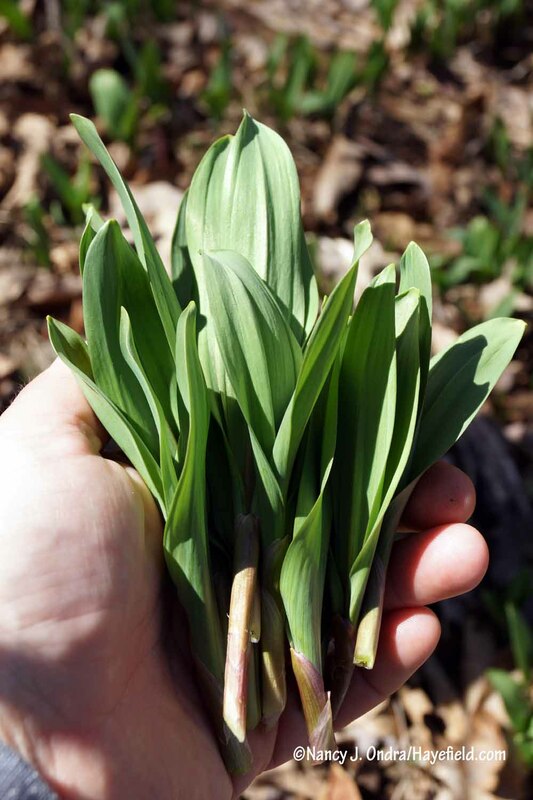 Yet another wildling that likes to grow in groups is ramps (Allium tricoccum). 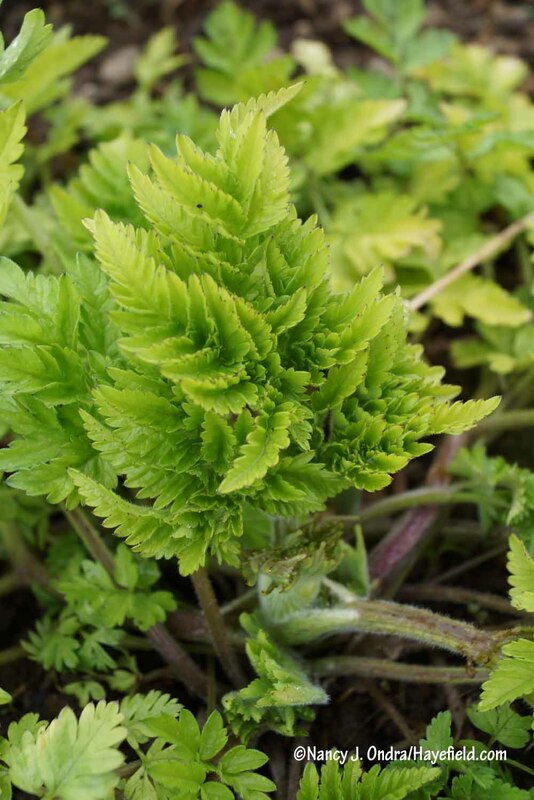 Though I’m careful to take only a small harvest, I still feel guilty about bothering the patch in our woods, so I’m hoping to get some established in my garden. To that end, I collected some seeds in October of 2015, mixed them with moist vermiculite, put them in a small zip-sealed plastic bag. They sat on my kitchen counter for 3 months, then in the refrigerator for 3 months. There was no action, so the bag ended up sitting on my potting bench in the basement for about a year. I found it when I was tidying the bench a few weeks ago, and hooray: The seeds were starting to germinate! They’ve been potted up for about 3 weeks now. Besides hovering over pots of seedlings, I’ve been working on some garden projects. The first was giving some love to the “no-mow” grass paths I sowed back in April 2015. They lived up to their name last year: I didn’t do a thing to them after June, since it was so dry and they pretty much stopped growing. 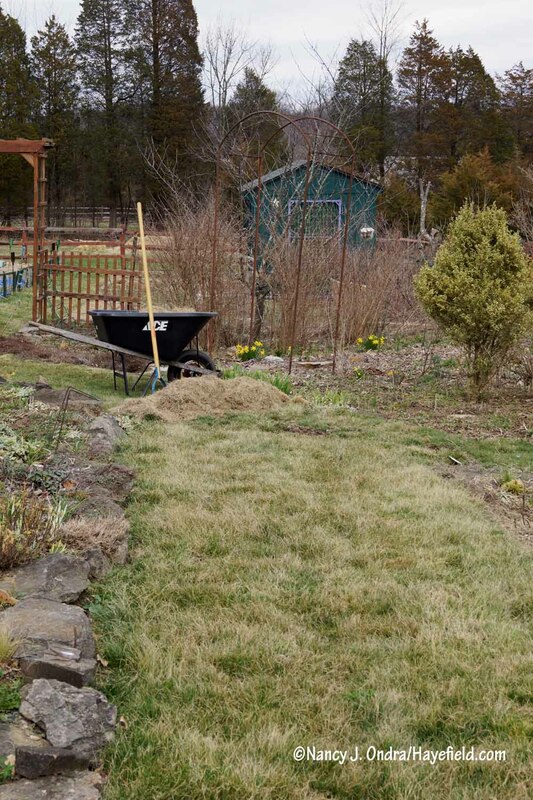 They looked rough through the winter, so I decided it was worth putting some time into a vigorous going-over with a dethatching rake and the reel mower to get rid of some of the dead stuff. It didn’t look much better right after but is starting to green up nicely this week. 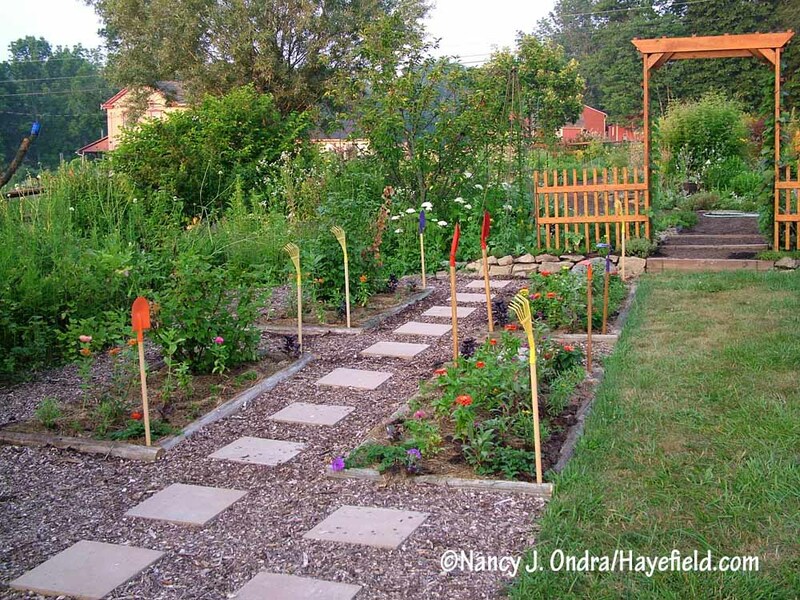 Back in 2011, I made a little cutting garden area next to the vegetable garden. It was pretty cute back then. But this is the dismal state it’s in now: still functional from a planting standpoint, but it has become more of a holding area, and the paths are a mess because I needed the pavers for the greenhouse floor. I already have the materials on hand to bring new life to the area and hope to be able to show it off by the next Bloom Day. There should be some other big changes by then as well. I’ll give one photo as a clue. Those of you who visit regularly may notice that there’s something different about this view. The good folks at Monarch Watch are looking for volunteers who are willing to observe and record the presence and activity levels of monarchs in their garden this year. 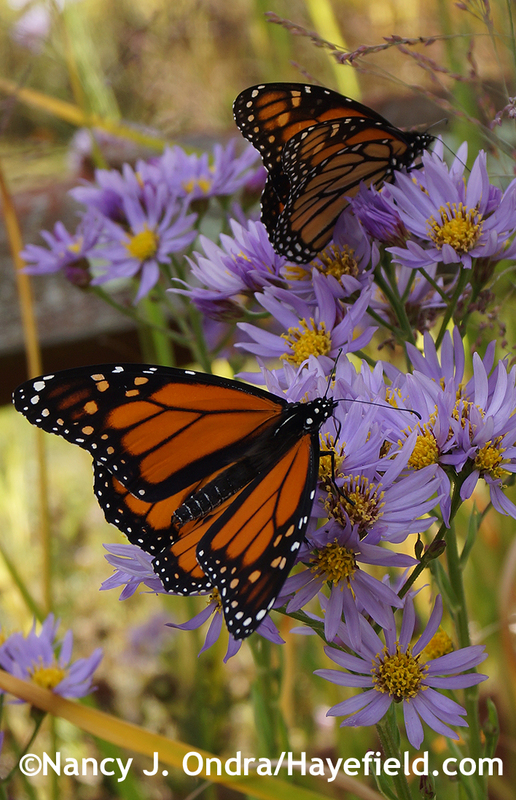 If you’d like to learn more about this important project, you can read all about it on their blog at New Monarch Watch Citizen Scientist Project. 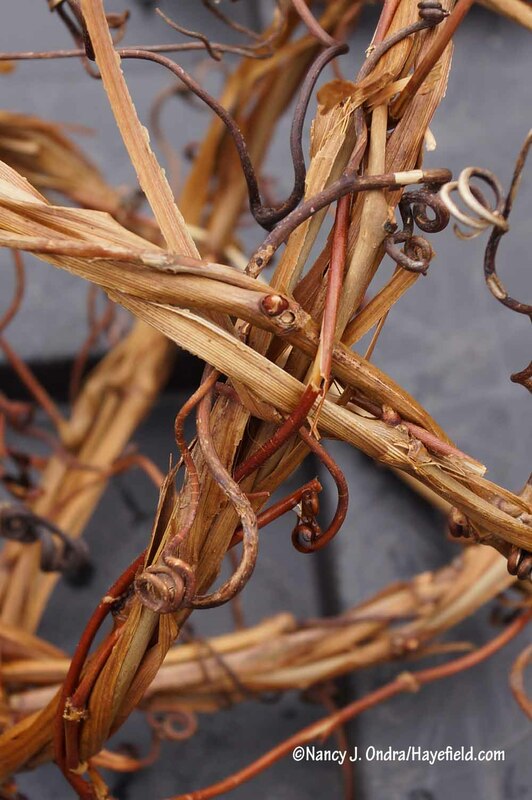 It’s a little late in the season to mention this, but…if you haven’t yet disposed of your vine prunings this spring, considering making them into a nesting ball for your birds. I find the vines from wild or cultivated grapes are easiest to work with for the frame of the ball, though kiwi vines can work too. Start by cutting a piece about 4 feet long. Bend it gently with your hand, working it into a ring about 6 inches across. 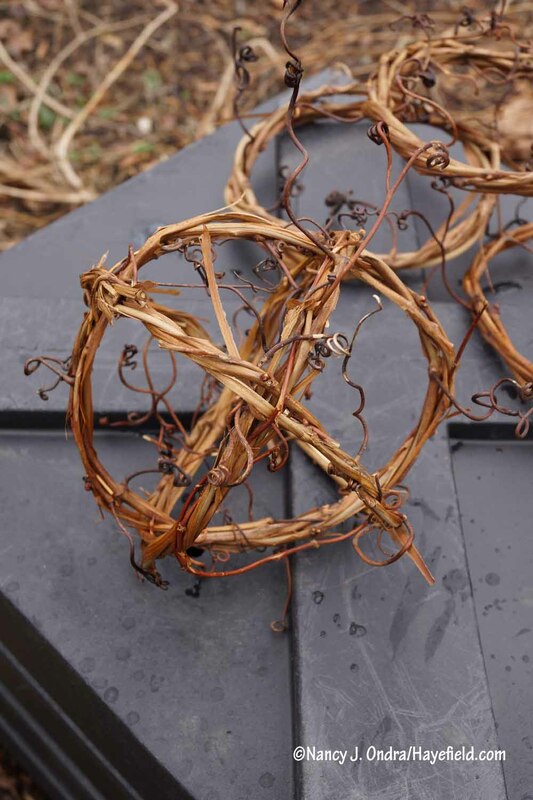 Continue to wrap the rest of the vine around the ring so it holds together. You’ll need a total of three rings. Weave three 6-inch rings to start your vine globe. If you’re using grapevine, try to leave the tendrils on; they’ll be useful later as natural fasteners. Fit two of the rings together at a 90-degree angle. Then slip the third ring down over the other two to form the “equator” of the globe. This part can be a bit tricky but be gentle and patient with the rings and they’ll eventually fit together snugly. Before finishing the outside of the globe, I like to weave some thin wild or garden honeysuckle vine through each of the points where the rings connect. Or, if the grapevine rings have some tendrils in the right places, you can curl those tendrils around the joints. To finish the globe, use more honeysuckle or thin grapevine to weave randomly around the sides. I usually use pieces about 9 inches long for this. The more often you can work these vine pieces into the frame rings as you go around, and the more effort you put into weaving them over and under other pieces, the sturdier your ball will be. It’s not a serious engineering project, though; it’s supposed to be rustic, so don’t fuss about making it look perfect. To use the globe as a nesting ball, leave some gaps in the covering so you can stuff in nesting material. I’m partial to alpaca fiber, of course, but you can also use wool or other animal fiber, bits of yarn or fabric, or even dried grasses. If you’d prefer to use the globe as a garden ornament instead, you may want to make the outside weaving a bit more dense, or just leave it with gaps. 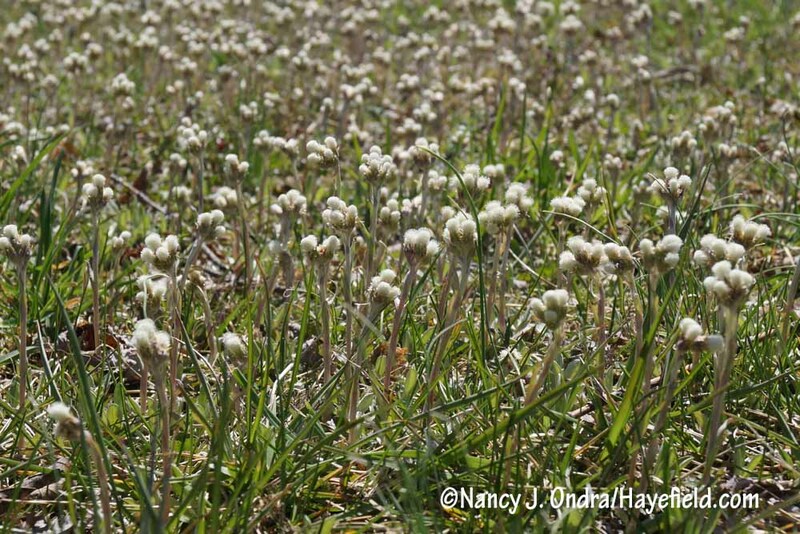 Sitting on the ground, the globe may last about a year; as a nesting ball, it’ll likely last 2 or 3 years. My excuse for taking a break from blogging this past winter–for my first stint as Editor-in-Chief (i.e. primary writer and photographer) for a magazine–has finally become reality. Perennial Garden Ideas is a single-issue magazine packed with ideas on versatile plants and design ideas. My regular readers may notice that quite a few Hayefield photos are included too! You can find it in the special-interest section at most places that sell a variety of magazines, or order it online at Perennial Garden Ideas 2017. If you’ve made it to this point, I have to ask: What are you doing inside reading this post? 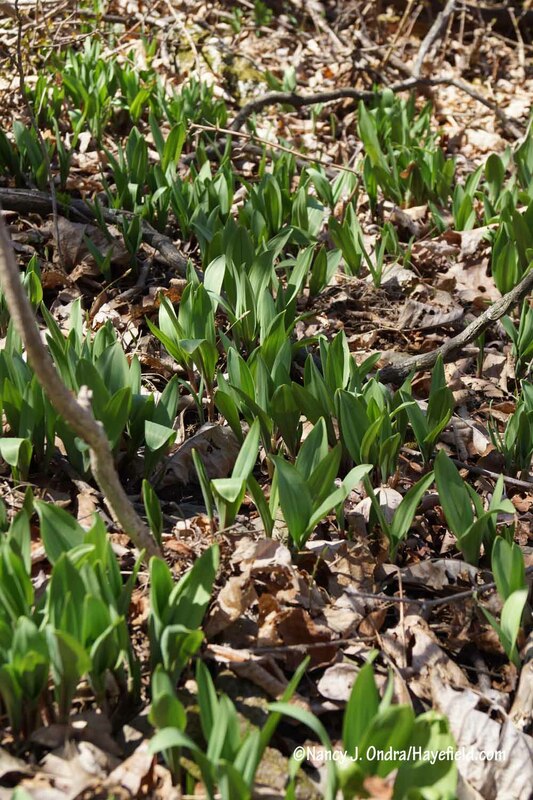 Take off that heavy winter wear and get outside to enjoy the start of the growing season! Sorry, Duncan. I know the haircut I gave you looks bad, but it’ll grow back, and at least you’re cooler now. 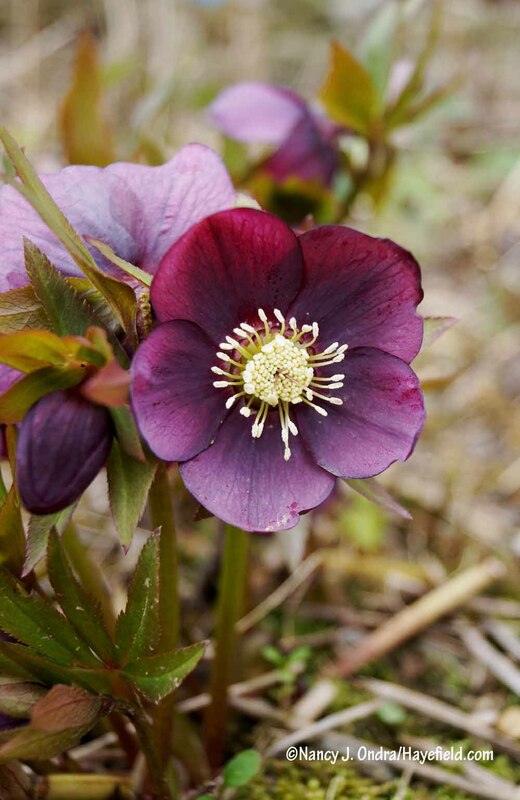 If your weather isn’t conducive to being outdoors at the moment, then enjoy some virtual garden touring by checking out the other participants in this month’s Garden Bloggers’ Bloom Day at Carol’s May Dreams Gardens. WOW, you have lots of colour! I just have crocus and snowdrops so far. 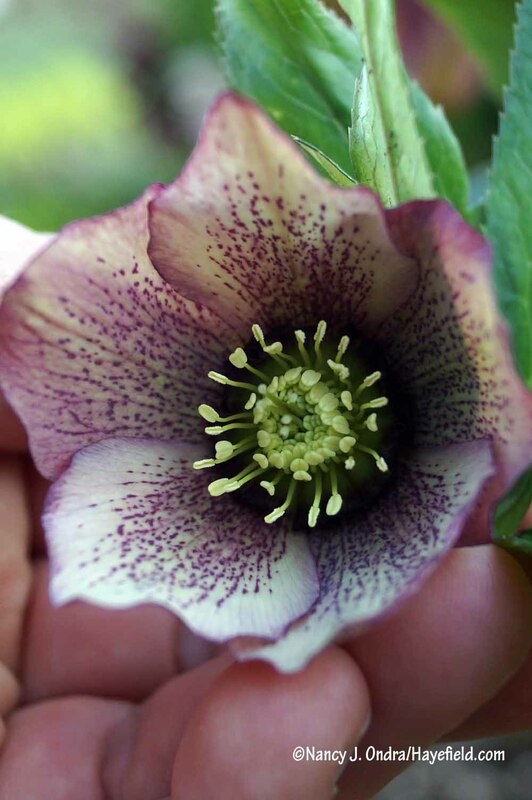 The hellebores are lifting their heads, not open yet. There is still snow in my woods although the peepers are back in the pond. Congrats on your new job. Looks like a great magazine, will look for it here. Love the globe decoration, you have so much patience. 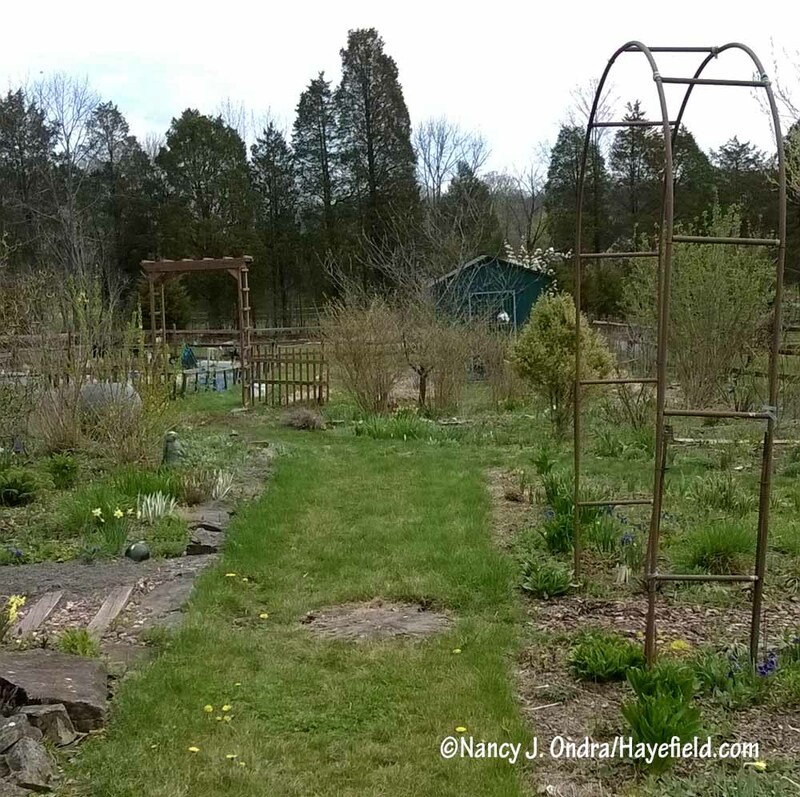 I’m making a new butterfly garden this year, hubby has already leveled it for me, just have to wait for drier weather to till in compost and plant. I have started milkweed and coneflowers from seed, also dividing some earlier perennials for local butterflies. I have only been getting one Monarch a year for the last few years. Hey there, Sue! 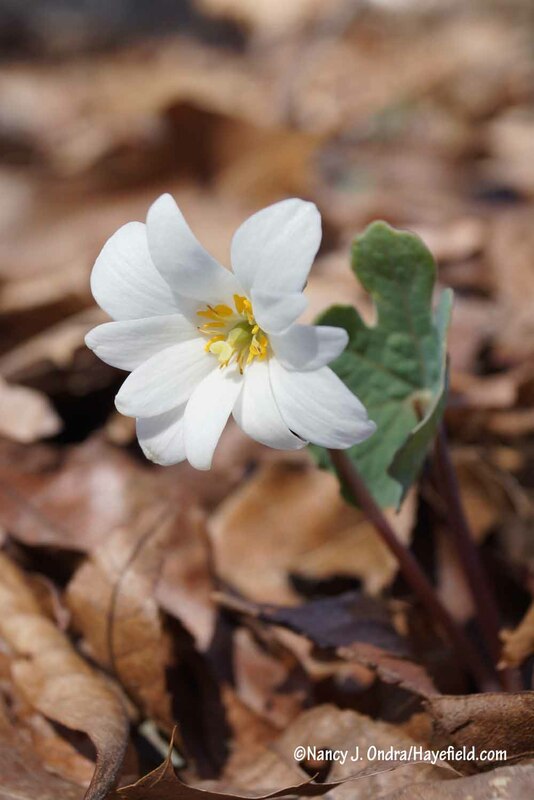 It seems to me that you’ve still had solid snow cover for some previous April Bloom Days, so it’s good to hear that you are already enjoying some flowers. And how wonderful that you are in good shape this year for new garden projects. Have fun with your new butterfly garden. By the way, the Monarch Watch team would probably be interested in knowing when any monarchs make it as far north as you are. Not much sitting around here this spring. We have taken out 6 shrubs that are considered invasive around here. This of course means that we had to choose 6 shrubs to go back in. Which means we were shopping for shrubs and several more were planted as well. Interesting when you go into a nursery with the thought of shrubs instead of perennials. 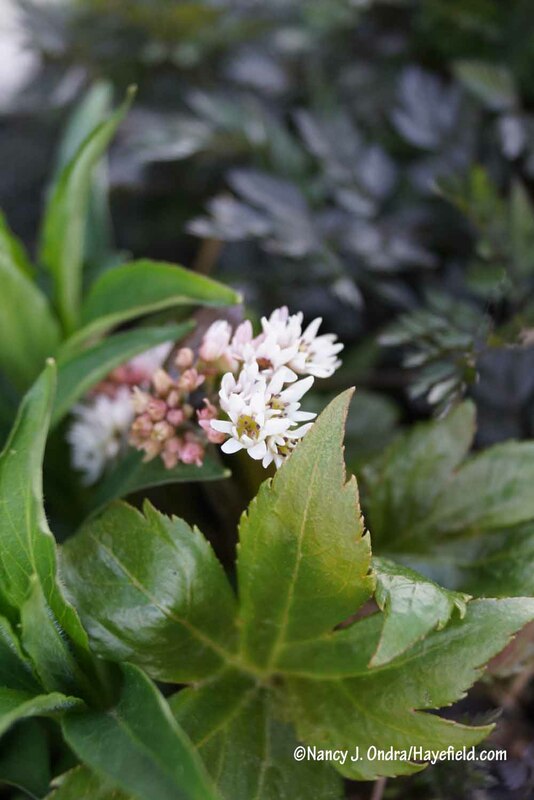 Now that the shrub fever has passed there are several perennials that have been instated. I am racking my brain trying to remember what is different in you garden. :) I will look forward to the big reveal. Congrats on your new venture in the magazine business. I will look for this mag. Poor Duncan, he looks as if he is saying what are you doing to me? I hope he isn’t as miserable as he looks. Well done you, tackling that big project first thing. It makes your place look so different, doesn’t it? 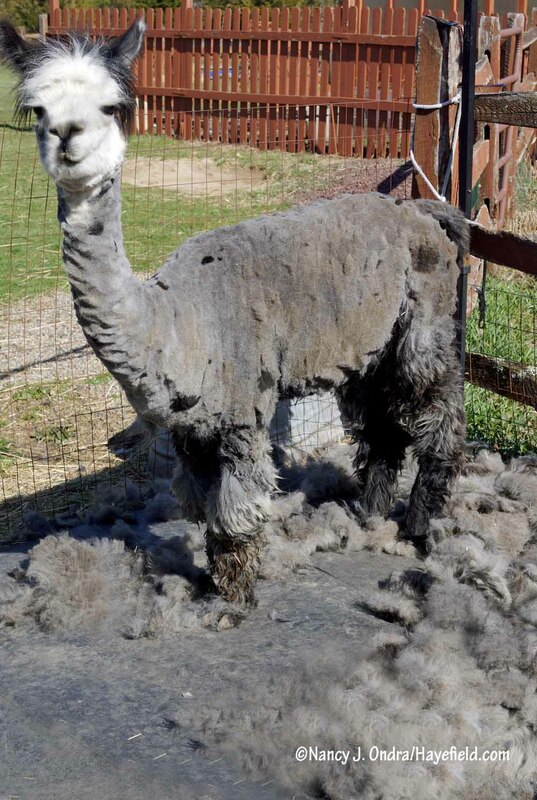 And yes, shearing is never a happy event for a critter who doesn’t like to be touched, but it’s a joy to watch him frolic afterward like a youngster. If only it were as easy for us to lose 10 pounds so quickly. Happy spring to you and yours! Hi Nan – So nostalgic to see all my favorite (since childhood) natives featured here. 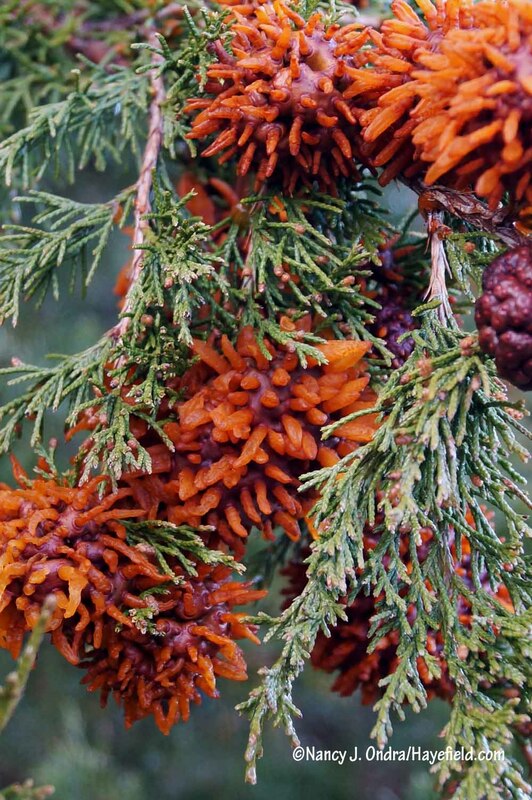 And only YOU could make cedar-apple rust gall look desirable!! Looking forward to lingering over the second half of your post later. Wishing us all Happy Gardening! Hi Tiiu! 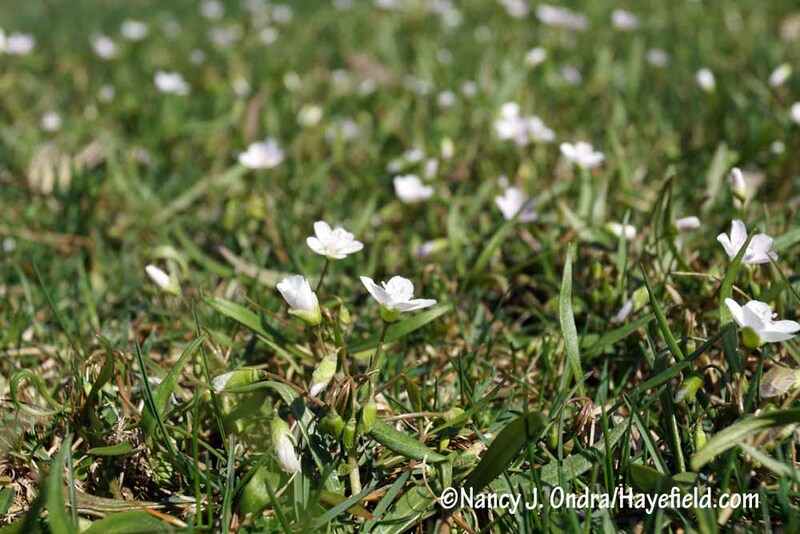 Hunting for the wildflowers is always a treat. 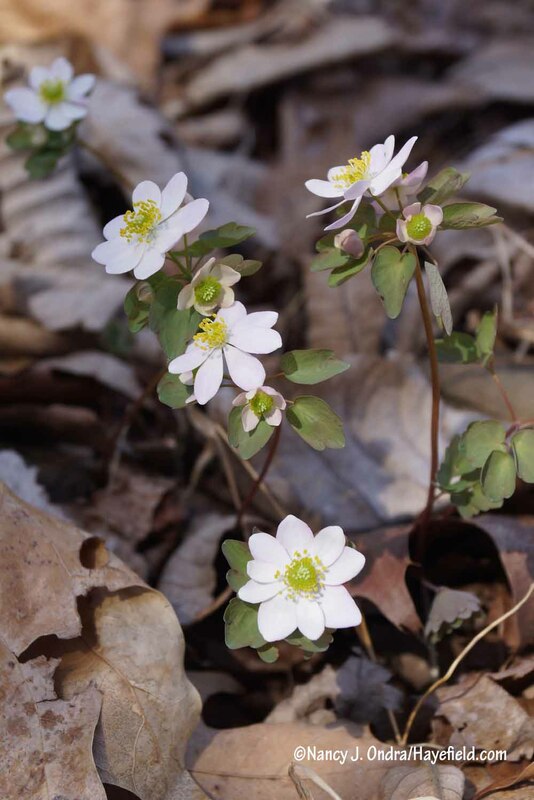 Some, like the spring beauties, are everywhere; others, like the hepaticas and the wood anemones, have stayed in certain small places since I’ve been watching them–nearly 50 years now. And yeah, when you’re surrounded by hundreds of Eastern red cedars, you have to learn to accept the rust galls and maybe even develop a grudging appreciation of their weirdness. Have a good day in your garden! 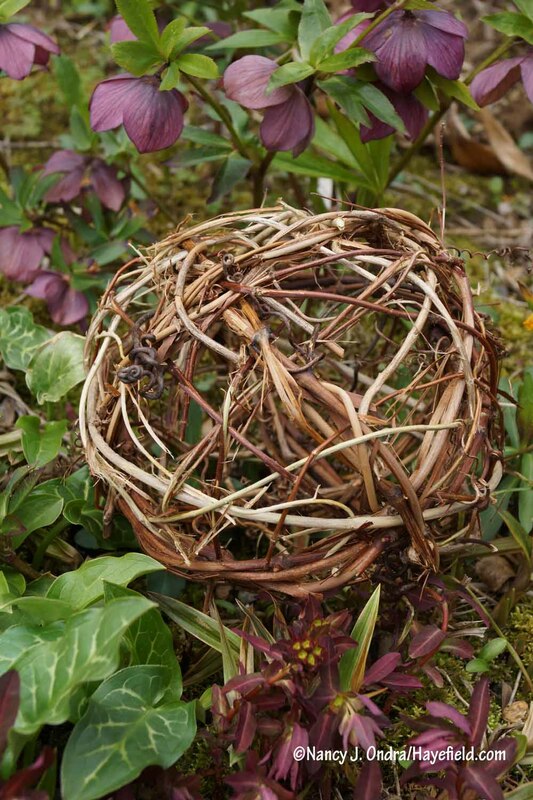 I love the vine globe idea, I am not sure I have a vine that will work (runner beans and native clematis? ), but I might give it a go anyway. Duncan’s expression in the last photo just made my morning. Thank you. Good morning, Laura. 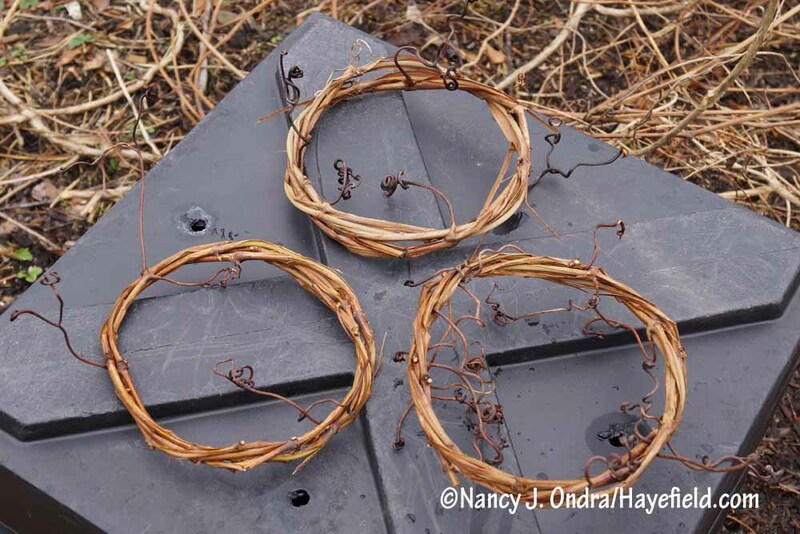 I’ve seen other vine crafts where people purchase already made grapevine wreaths, then unclip the wires holding them together and soak the vines to soften then before weaving them into other shapes. I find the native clematis vines to be a bit too brittle, but if you’re very gentle with them, they might work for the covering step. That being said, it’s a rather time-consuming project, probably worthwhile only if you have a lot of cut vines already on hand and want to do something useful with them. 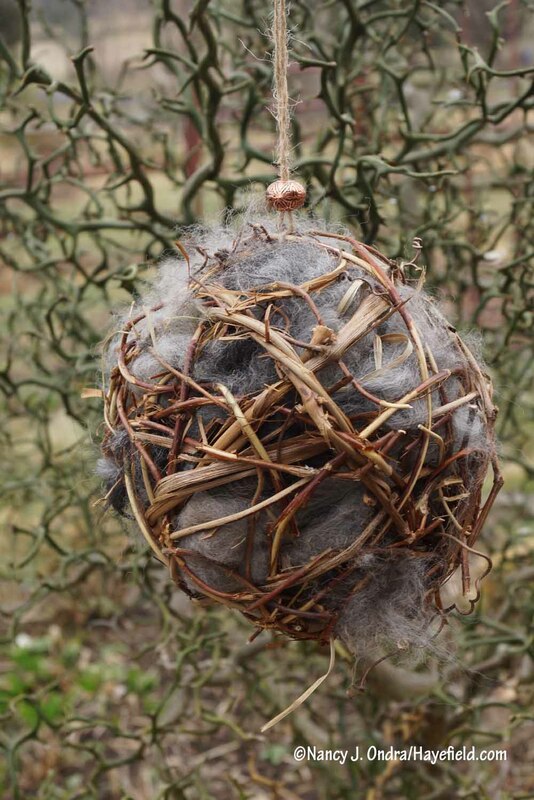 Craft stores often sell small, premade twig balls that can be used for nesting balls, though you made have to widen a few spots in the covering to get the fiber in. My neighbour has a vine that is creeping into my garden [looks similar to Virginia creeper, but doesn’t seem aggressive as I would expect] so I trimmed some and tried out two hoops with success. I thought you might be interested to know that my daughter found them and they have now become her ‘nature crowns’. So, you have had a great idea for globes AND children’s headwear! Hey, that’s neat, Laura! But surely not just for children; some of us grown-ups could probably get away with wearing a handmade crown. In appropriate social situations, of course. Good morning! Thank you for sharing your spring blooms of which you have many. My goal this year is Spicebush. Do you find they need full sun or would they work on the north side of a woody area? Also, I love the globe for the birds which will be my next project. I have lots of wild grapevine along side the road that I can gather. Good morning, Ann. 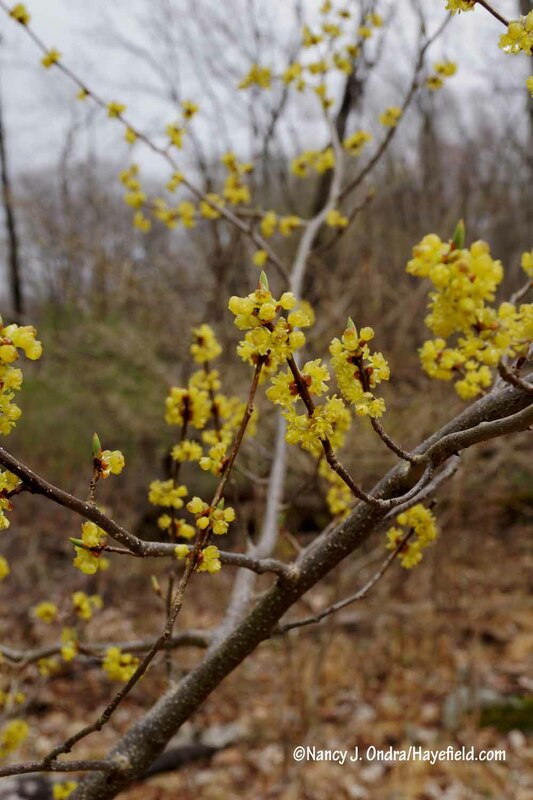 I’m not sure where you live, but here in PA, spicebush usually grows as an understory shrub. The plants seem to have a better shape and bloom much more abundantly where they get more light, though. I have enjoyed the tour of your garden! Now I am taking your advice – logging off the computer and going outside! Happy Happy to you too, Lea! Thanks for visiting today. I will be following my own advice soon; it’s a promising day to get going on those new garden projects. I will look for the magazine as you are always a wealth of information and inspiration. Love that Heucher/Cottoneaster combo as I have a number of each growing in different locations. Need to make them neighbors! Thanks, Linda! The magazine is geared more toward beginning gardeners, so it may be too basic for you, but there’s plenty of eye candy to enjoy. 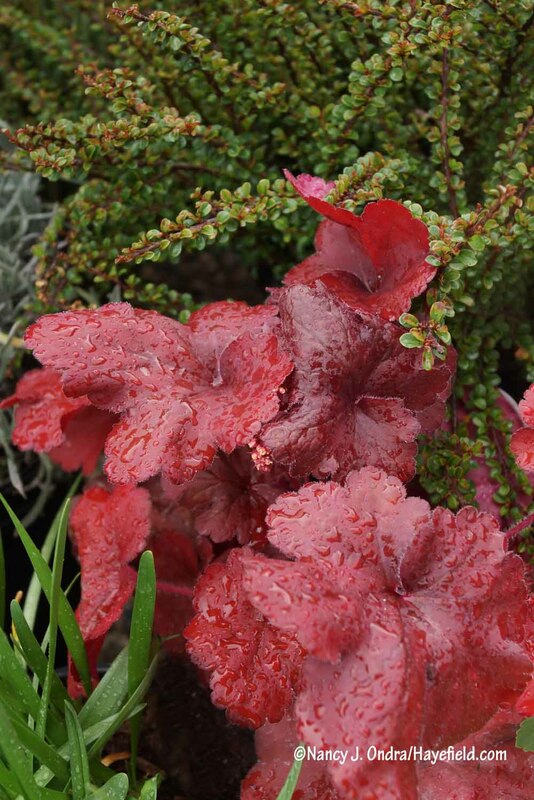 That cotoneaster has the tiniest touch of red that makes any reddish heuchera a promising companion. Enjoy! Hi Nan! Love the vine globes and huge congratulations on your editor position! You will be great! Thanks for the post. Thank *you* for stopping by today, Wendy, and for the kind words. The magazine is only a one-time thing, but I’m hoping they may invite me to do another one someday. Happy Bloom Day to you! 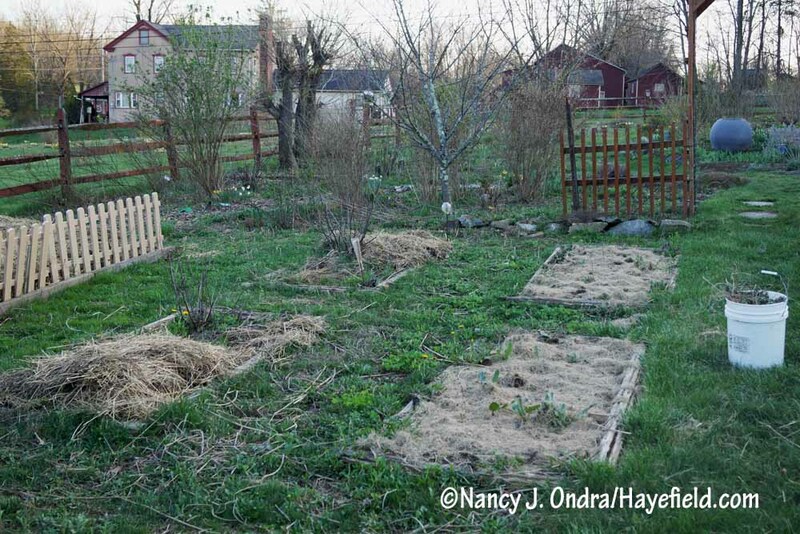 I was heartened to see the state of your cutting garden. I have plans this year to renovate an area that is in a similar sorry state. It’s good to know even a gardener I hold in such high esteem has work like that to do too. We in the PNW are having a very cold and wet spring, making progress outside difficult. But the forecast for today is for sunshine, so I do need to get off the computer and head out there soon. As usual, great shots and great combos of plants! I’ll be looking for that magazine! I send you good wishes for continued good weather and steady progress, Alison. The project I started with today, which should have taken less than an hour, is on 3 hours and still not near done. I am once again reminded why I believe landscape fabric to be the creation of some dark force existing in the universe. Those nesting balls are genius! Every year I swear I’m going to make some rustic cages to protect sedums from rabbits. This year I did actually make one, from winter honeysuckle shoots wrapped with Virginia creeper and grapevines. I need more, but at this time of year there’s too much else to do, so chicken wire for the rest. Sedum ‘Thundercloud’ got the craftsy cage, being the most compact and the most chewed-on last season. 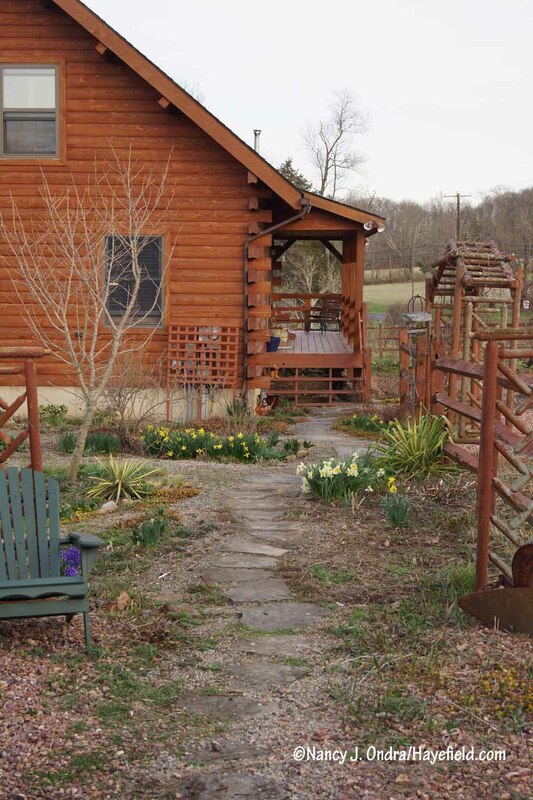 Hayefield and my garden are in the same winter hardiness zone more or less, but down here in the Blue Ridge foothills all the mid-April phenomena you’re showing happened in mid-March this year. There was a little (sleetless) spell of hard freezes in late March (16-20 at night), but it looks very much as if that was our last frost. Now it’s 50s and 60s at night, 80s during the day, and we’re so far behind on rain that I’ve stopped hoping and am watering deeply. It’s June in April, which is pushing quite a few things into bloom weeks ahead of the norm. Praying for April in May… very much WITH the supposed showers. Weaving cages from the vines is also a brilliant idea, Nell, I will have to borrow that idea for next year. It has been a very odd spring here: almost summer-like in February, then cold in March. Things to be settling down now, though the timing of many plants is a bit off. We were having regular rains for a while; however, it’s already getting dry again. I guess it’s too early to worry about this year being as dry as last year, but…. Very excited to see your magazine! Heading out to Lowe’s for a copy right now, since it’s unbearable for garden work at the moment — 85F and choked with pollen. I try to stay out of L’s garden center to avoid temptation (and neonicotinoid-treated plants), but the garden mags are by the much-less-dangerous light bulb and hand-drill section near the checkout. I looked at my local Lowe’s yesterday, but their magazine display was gone; not sure why. I did find the issue at a grocery store, though. 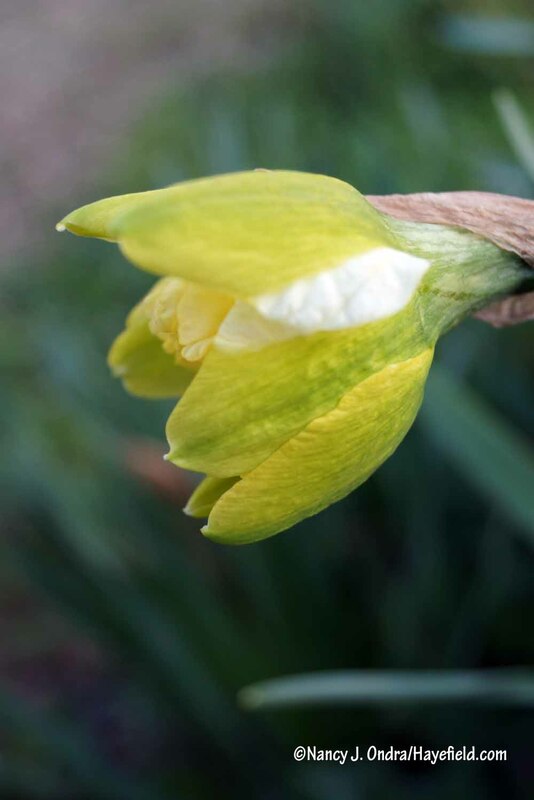 There’s a good chance that your unknown double daffodil is ‘Obdam’, a double sport of ‘Ice Follies’. 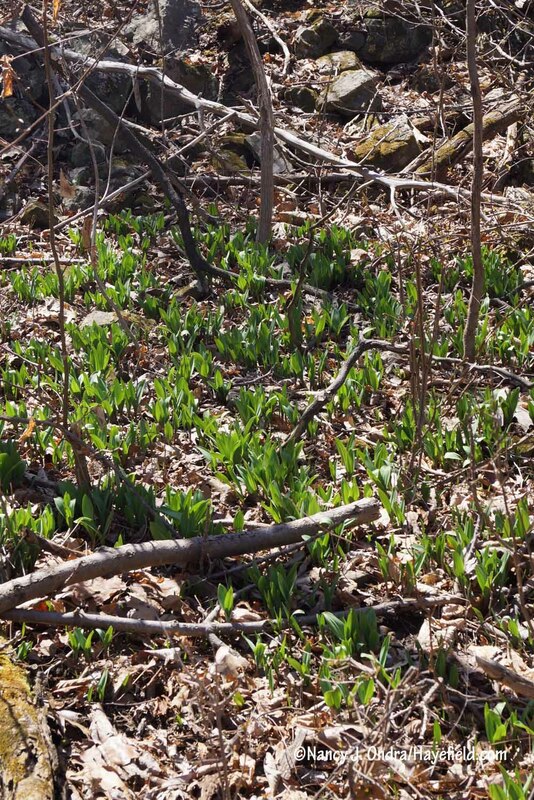 There’s a patch here planted by my father, which unfortunately are positioned so that they bloom especially early and are routinely struck down by inevitable freezes. Have been intending to move them to a spot where they won’t come into bloom quite so early; in the meantime some of the clumps have reverted to single blooms — which I have to admit I like better. Oh, how interesting! I did plant ‘Ice Follies’ many years ago and still have several clumps in that area. I guess some sported into that version. I agree that the single version is lovely, but I rather like the chartreuse markings on the double too. Thanks ever so much, Nell! Hi Nan, as always I enjoy your posts, and always turn to you for planting ideas, been to my local plant nursery today and bought lots of perennials, unfortunately here in NW England, the weather has gone back to Winter, wind, rain and frosts forecast, so not able to get out and garden, so what better than to browse your site and make plans for perennial partners. It is said that imitation is the sincerest form of flattery, so I hope you don’t mind me pinching your ideas. Hello Allan! 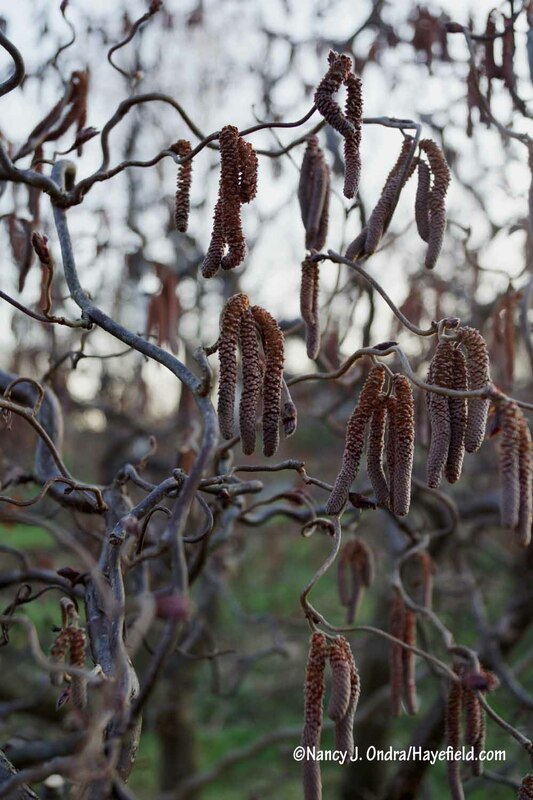 If you can’t be out working in the garden, then plant shopping and combination-planning are both wonderful ways to pass the time. I really hope your weather settles soon. And goodness, I’m always honored if anyone finds one of my combinations worth trying! Congratulations on the magazine! I’ll be on the look-out for it. 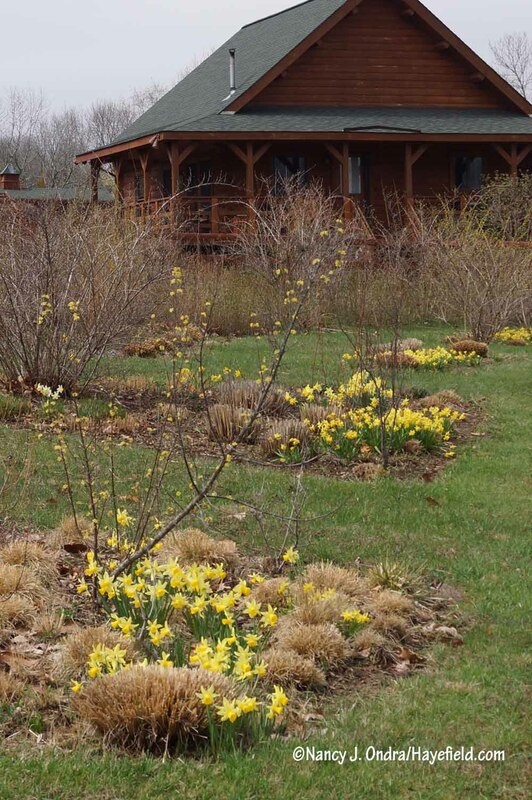 That noID Narcissus is gorgeous, as are all your spring bulb blooms. 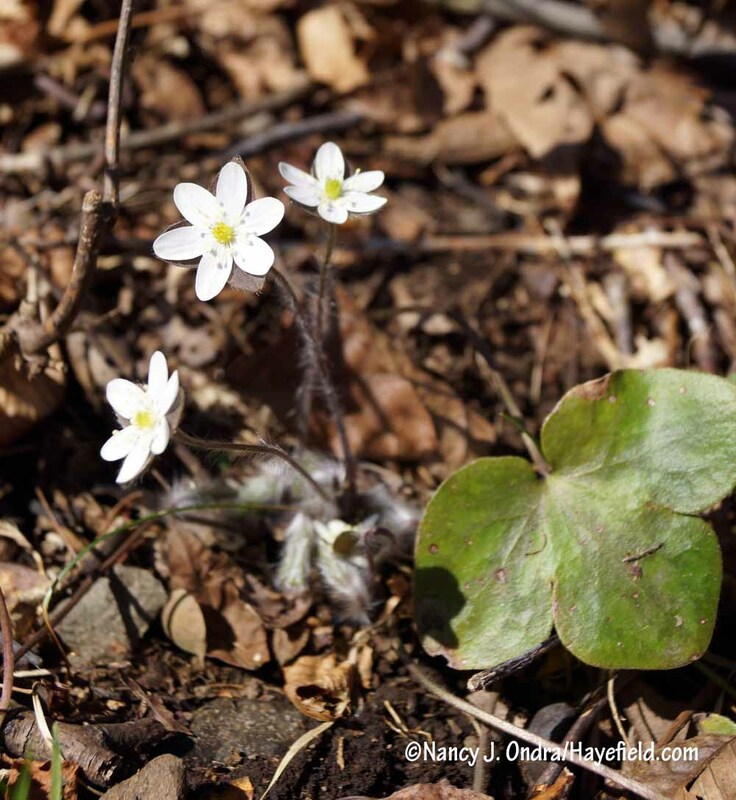 How I wish I could grow Hepatica. My bulb blooms are mostly over and done with but then spring gets an early start in SoCal. I may pilfer your Spanish lavender-sage combination and the vine globe idea. Happy GBBD, Nan! Hi Kris! To be honest, I’ve never tried growing hepaticas in my garden. They’re so specific about where they appear in our woods that I figure it’s unlikely they’d want to be over here. 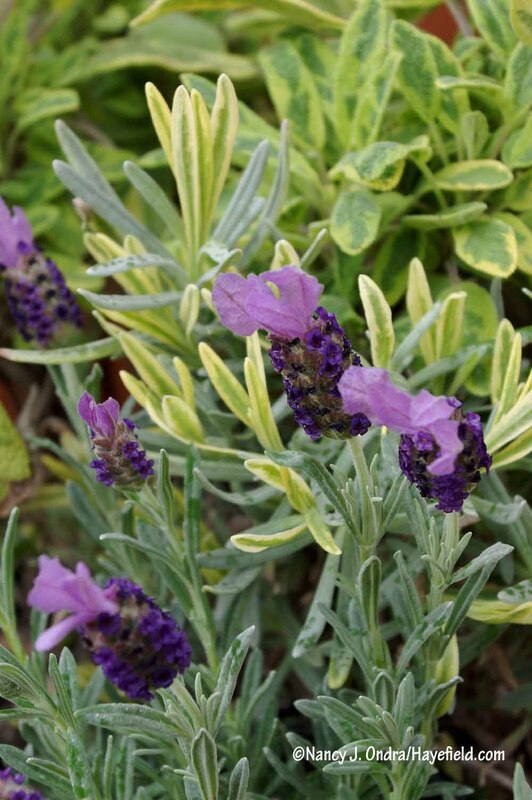 I also have to confess that I stole the idea for the lavender-sage combination from another photographer’s photo in the magazine. Happy Bloom Day right back to you! Welcome back and congratulations, Nancy. I’m looking forward to seeing the magazine. Thank you, Barbara. It’s always fun to get back in Bloom Day mode. I hope you are having an enjoyable spring! 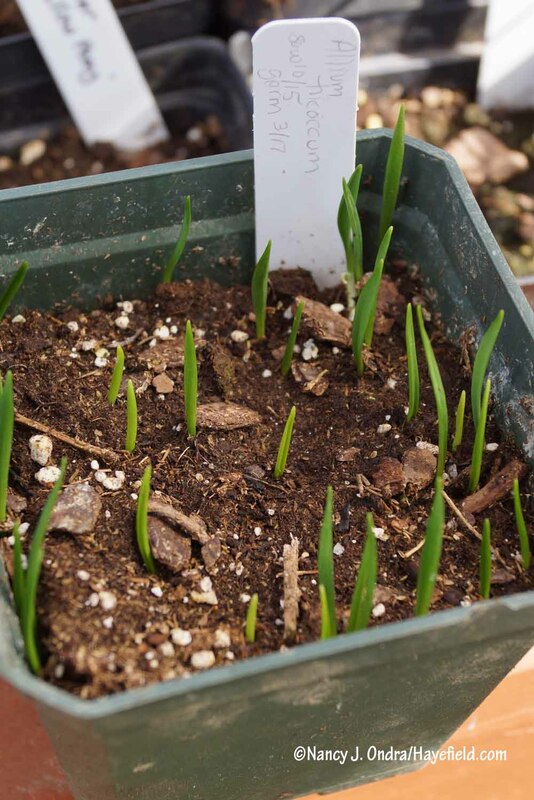 The Allium tricoccum seed you shared with me back in Fall 2015 has germinated here, too! I can’t imagine ever having enough to eat, but I’ve got a good start. Thanks so much for sharing! It’s great to hear that, Matt! At 18 months for germination, it will indeed take a good while to make a patch large enough for harvesting. I wish I had collected more seed last year; will try again this summer. so many things to see in your garden! I adore that 2nd picture with the daffodils and the Lenten Rose – i think we always appreciate what we can’t have. And a great idea about the vine globes! I should try that. Happy GBBD! A very good morning and happy Bloom Day to you, Renee! And you are quite right: I’m envious of the many different things you can grow as well. You brightened an already bright day, Dee; thank you! It’s great to hear from you. 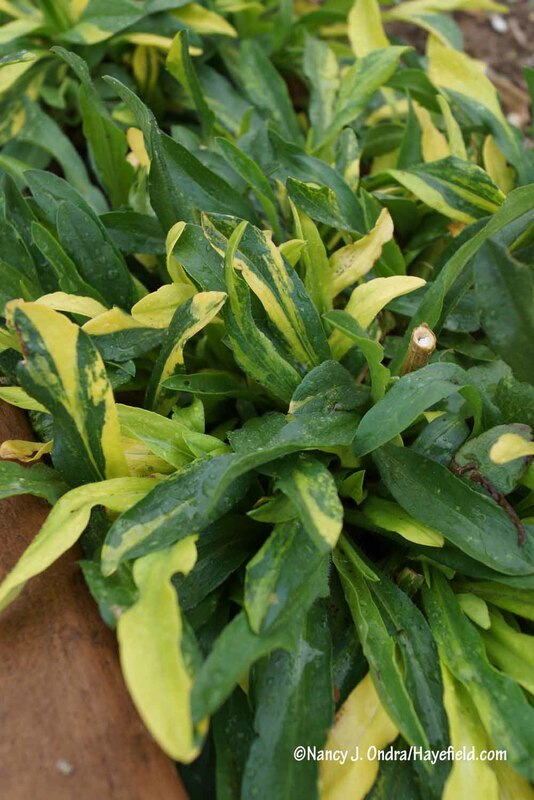 Let’s hope that your good growing conditions continue through the growing season. And we’ll see if my garden can’t catch up a bit by next month. Technically, we could have frost for another month yet, but *maybe* we’ve seen the last of it already. It’s soooo tempting to take a chance and start planting out tender stuff! Thank you for the inspiration. Always good to see new combinations of color and form. Congratulations and best of luck with the magazine. Great gift for every gardener on my list. Hi Mary! Thanks for checking in. I was thinking good thoughts of you recently when sowing some of the seeds you originally shared with me. I hope you and your garden have a good summer! 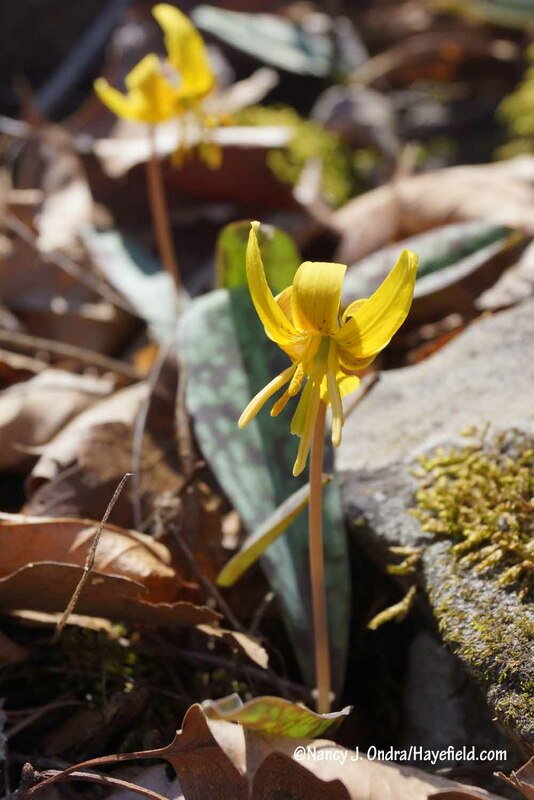 It’s still cold up here in Canada’s capital, but the snow has pretty much gone and some bulbs are flowering. 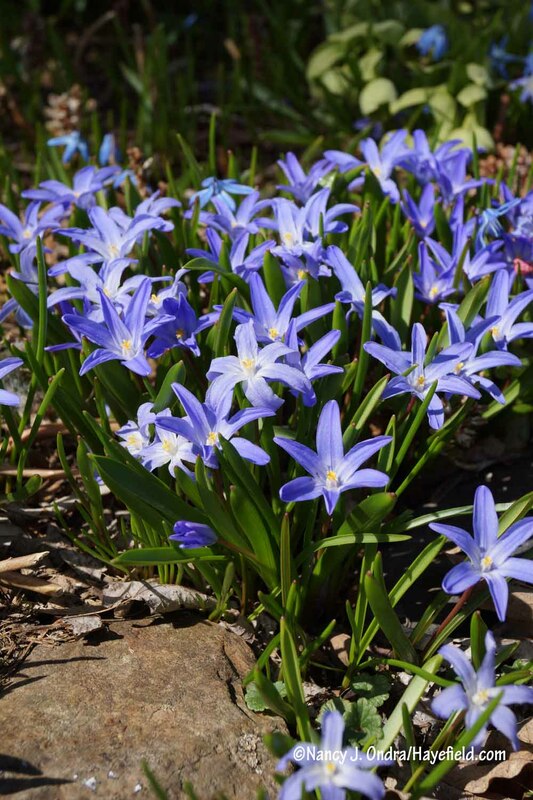 The ineradicable Scillas, of course, with gorgeous blue flowers but propagating hyperactively! 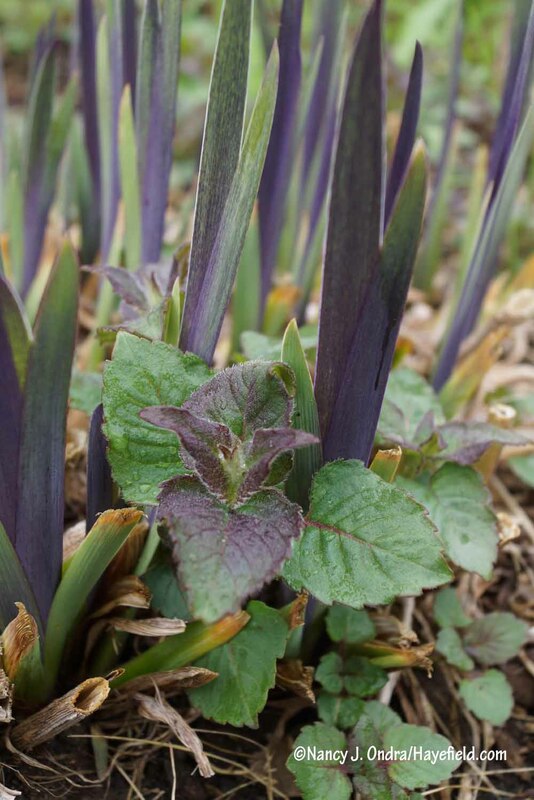 But also some new Iris reticulata planted last fall, ‘Eye Catcher’ and ‘Splish Splash’. These multiple award winners were bred by a Canadian (Alan McMurtrie – please excuse the patriotism!) with colour combinations and markings unusual for these tiny irises. ‘Splish Splash’ is finished and ‘Eye Catcher’ is leaving, but both were delightful while they lasted. I’m now waiting for daffodils to start. (Love your photos of them.) They are probably my very favourite flowers (except for all the rest, of course), and I especially favour the ones with fragrance. Naturally, though I push zone barriers madly and grow all kinds of things unlikely for this area, I can’t grow daffodils. They come up beautifully the first year, and then dwindle and die out within 2-3 years. 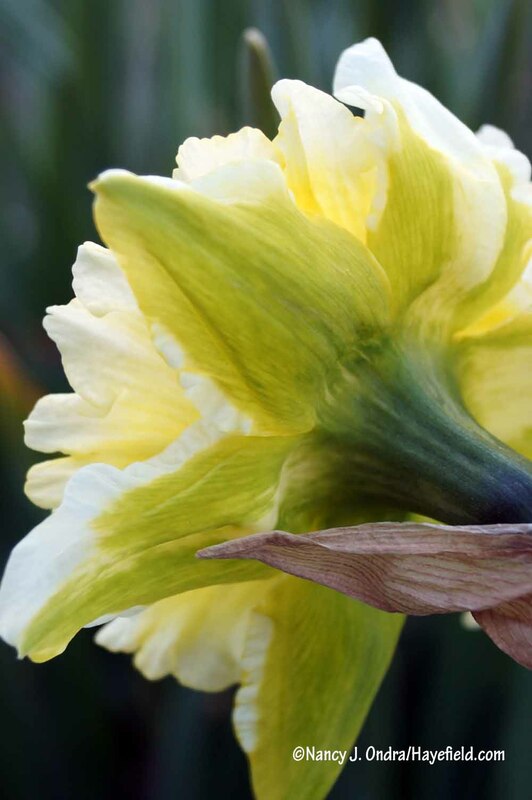 The exception, though, has been Narcissus ‘Quail’ – sturdy short stems, fragrant, and several blooms for each bulb. The clumps have even expanded enough to be divided! So if you’re looking for another one to plant, you could do worse than plant some Quail. Thank you for the blog. I especially like reading about your plant combinations. That’s truly an art. Looking forward to your next Bloom Day, and good luck with the magazine. Hi Marie! I’ll have to check out those new iris selections; I really enjoy the reticulatas. 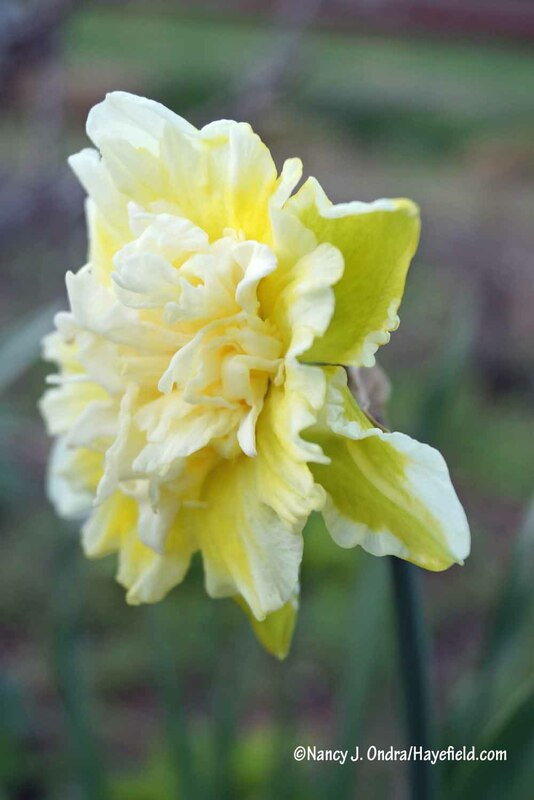 Thanks for the tip about ‘Quail’ daffodil too. I hope you thoroughly enjoy your spring season! I am french so my english is not very well but I hope you understand me !!!!! Thank you for reading, and for subscribing! Thanks for your so pretty photographies ! I asked you for subscribing? You should be able to find the subscription box on the right margin, below my book list and the link to my Pinterest page. After you fill that out, WordPress will send you an email to confirm your subscription; you’ll need to respond to that to complete the process.